The Chinese national science and technology major infrastructure, Shanghai Coherent Light Facility (SCLF), organized an international review meeting for the Station of Extreme Light (SEL) in Shanghai on July 10, 2017. The reviewing committee members included experts in strong-field laser physics, high-energy-density physics, and theoretical physics from Germany, USA, UK, France, Japan, Canada; and China chaired by R. Sauerbrey and N .Wang. The working group, led by Ruxin Li of the Shanghai Institute of Optics and Fine Mechanics (SIOM), Chinese Academy of Sciences (CAS), has made a series of breakthroughs on high energy, high power, and high-repetition laser system development. The developments proposed are based on solid research carried out at SIOM (and other scientific organizations). In particular, the research and development of the OPCPA laser amplifier at the highest power level at SIOM. Shown in Figure 1 is SIOM’s 10PW laser CPA device and the 10PW laser system. The 10PW laser system, Shanghai Superintense-Ultrafast Lasers Facility (SULF), is based on CPA technology and the diameter of the Ti-Sapphire used in the main amplifier is 235mm, which is the largest crystal for the laser manufactured by the scientists at SIOM. Based on these developments, SIOM has launched a 100PW laser system, Station for Extreme Light (SEL). This system has two significant salient features. First, the level of its power will be an order of magnitude beyond the planned highest-powered laser, Extreme Light Infrastructure (ELI). Secondly, its design is a combination of the 100PW laser as part of the system in the SCLF’s XFEL. This project received strong endorsement from the International Review Meeting that convened at SCLF of SIOM on July 10, 2017, and was approved by the Government of China. The overall funding level is approximately USD$1.3 Billion. Figure 1 10PW laser system in Shanghai pumped by CPA. The parameters of SEL are well beyond what has so far been available. Table 1 shows typical principal physical parameters. The coherent x-ray energy from the SCLF ranges between 3 to 15 keV (hard x-rays) produced from the superconducting x-ray free electron laser (XFEL). The photon number per pulse of this XFEL is 1012. Its pulse focusability is 200nm with the energy resolution of 0.6eV. The x-ray’s intensity at focus is as high as 1021W/cm2. The parameters of the 100PW laser for optical photons are as follows: Its peak power is 100PW, while its focal intensity is as high as 1023W/cm2. (If we can managed to focus better than this, it could go toward 1025W/cm2). While this is a single shot performance, it could deliver the repetition rate of 1Hz of optical laser if the power is at 0.1 to 1PW. These parameters by themselves are exciting. However, their coexistence and marriage as a combined unit shows a remarkable capability for future scienctific exploration. The combination of a synchrotron light source and an intense laser was first suggested and conducted in 1990s. Toshiki Tajima suggested that Professor Mamoru Fujiwara at Osaka University make use of the high-energy (8GeV) electrons of the SPRing-8 combined with an intense laser to make extremely high-energy gamma photons, which he did in his lab.2 Since then, the combination of these accelerator-based synchrotron light sources (or even more advanced XFEL with intense lasers) have come a long way. The present SCLF’s marriage of these two will uncover a new regime of science and greatly impact various technologies and applications, such as nuclear photonics and nonlinear interferometry. Table 1 shows the schematic layout of the SEL. The interaction of XFEL and the plasma chamber takes place in the experimental area. Figure 3 indicates the 100PW laser based on the OPCPA technology. Figure 2: Schematic layout figure of SEL that couples the 100PW laser with the XFEL. Figure 3: Details of the amplification stages of the 100PW laser based on OPCPA. The scheme of this marriage is seen in the concept of the SEL at which the coherent high-energy x-rays photons are shone in the configuration shown in Figure 2. This way we will be able to observe the interaction of the high-energy x-ray photons and most intense lasers and their developed matter interaction. This will greatly increase the experimental probe of intense laser-matter interaction. The XFEL beam will provide ultra-short MHz x-ray beam with energy range of 3-5keV and significantly large photon number of 1012. Specific x-ray energy of 12.914keV will be used for QED experiments with very low energy spread of 0.6eV. The x-ray beam will collide head-on with the 100PW laser pulse in the experimental chamber. The 100PW laser system contains four beams and each beam reaches the peak power of 25 PW. Figure 2 shows that the main laser system will occupy two floors and its power supply and control system are set at different floors. After the four-beam combination, the laser pulse will be sent to the experimental area on the bottom floor. There is a large-size vacuum chamber, where the 100PW laser pulse will be focused to 5μm and collide with the x-ray beam. Details of the 100PW laser system are shown in Figure 3. At the core is the OPCPA system. The 100PW laser pulse starts at high temporal laser source, where its temporal synchronization signal comes from the XFEL beam. This source will generate high-quality seed pulses, which will go into the PW level repetition-rate OPCPA front-end. 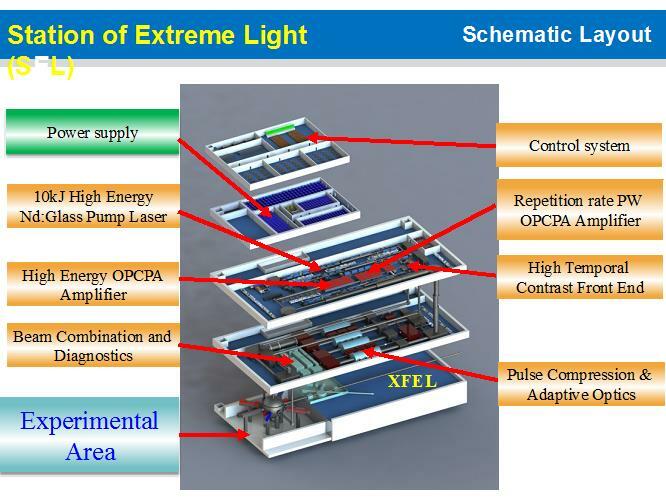 The laser energy will reach 25J and its spectrum width will support 15fs at PW level OPCPA front-end. The main amplifier is based on OPCPA technology and it provides 99% energy gain of the whole laser system, which requires sufficient pump energy from a Nd Glass pump laser. The final optics assembly will compress the high-energy of 2500J 4ns laser pulse to 15fs. After the compression, the laser pulse will be sent into the experimental chamber with the peak intensity 1023 W/cm2. 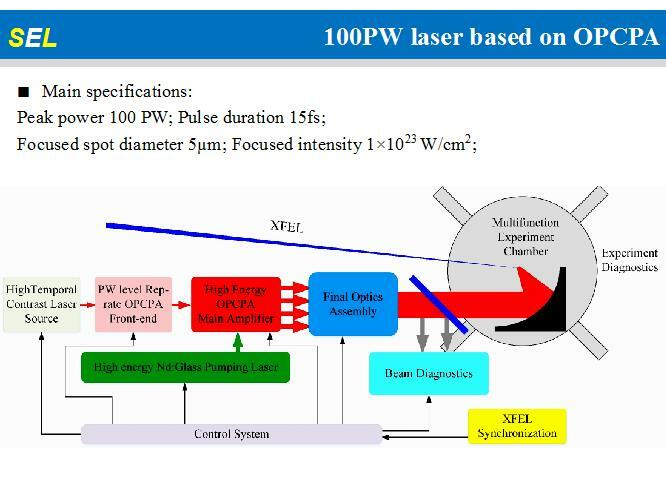 As shown in Figure 1, we developed and tested the performance of a high-intensity laser with CPA up to 10PW level. The proposed SEL aims to achieve the ultimate in high field science ,,. Here, we describe a simple way to reach that goal. The radiation dominance regime (1023 W/cm2) as described in Ref. 2 may be accessible and experimentally explored for the first time in sufficient details with the help of the coherent X-ray probe. As discussed in Sec. 1, if one can focus a bit narrowly, we may be able to enter the so-called QED Quantum regime (~1024 W/cm2),. However, it could go much further than that, since the invention of a new compression technique called “thin film compression11.” With this technique, a laser may be compressed to even higher power and intensity such as EW and further by relativistic compression into the shortest possible pulses ever in zs12. We will thus see the continuous manifestation of the Intensity-Pulse Duration Theorem into the extension of EW and zs . It will not only explore strong field QED physics ,, but we will also see the emergence of new phenomena at play in a wider variety of fundamental physics, including: (1) possible search of the proposed “fifth force” ,; (2) dark matter search by four wave mixing ; (3) x-ray wakefield in solid state matter  and related x-ray and optical solid state plasmonics ; (4) possible testing of the energy dependence of gamma photon propagation speed in a vacuum to test the foundational assumption of the Theory of Special Theory of Relativity ; and (5) zeptosecond streaking of the QED process . Chen et al. suggested the exploration of general relativity using the equivalence principle of acceleration-gravity to test the Hawking-Unruh process. In the issues of high field science, we often enter into the physical processes in higher energies and shorter timescales, which may not be easily resolvable in optical diagnosis. Here, the powerful XFEL’s resolution in time and space come in . X-rays can be also signatures in high intensity experiments such as laser-driven acceleration experiments . A typical display of such interplay may be seen in the diagnostics of the physical processes in the problem of x-ray wakefield acceleration in solid-state matter. In this case, nanoscopic materials with a nanohole structure  need to be observed and controlled. The surface of the nanotubes may be exhibiting surface plasmons and polaritons in nanometer size and zs temporal dynamics, best diagnosed by the XFEL. This is but an example of the marriage of a 20keV superconducting XFEL and a 100PW laser. In addition this technology will enhance studies in photon-induced nuclear physics  and the treatment of nuclear materials  (including nuclear waste), nuclear pharmacology, nuclear biochemistry, and medicine ,. Another example is to use gamma photons to mediate the vacuum nonlinearity caused by intense laser pulse to exploit zeptosecond streaking via the gamma photon mediation . In this scheme the presence of intense laser pulse and x-ray photon play a crucial role. If this example elucidates a beginning of exploration of zeptosecond photometric and zeptosecond optics, it would be an achievement comparable of the opening of the femtosecond optics flowing by attosecond optics . One more example of exploring the proposition was recently made for the Fifth Force . In the Hungarian nuclear experiment, a mysterious photon at the energy of 17MeV was observed. The paper  suggested this emission of gamma photon may be due to the unknown force (the Fifth Force). It may be helpful if we can inject a large amount of monoenergetic photons at this energy to see if the reversal of this process of photon emission (i.e. 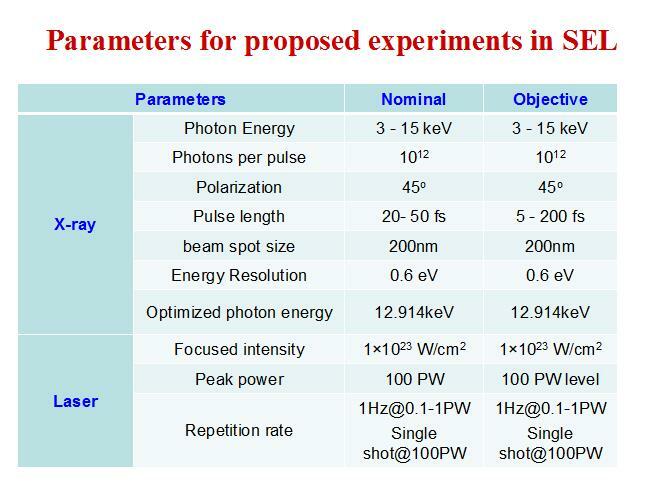 injection of photon) can explore this process more quantitatively. We can check of the fifth force (17MeV gamma)16,17,31 with the process and an outcome of the following, utilizing the energy specific laser induced gamma photon interaction: e + 17MeV gamma → e + X. Finally, there is a recent suggestion by Day and Fairbairn  that XFEL laser pulses at 3.5keV may be used to investigate the astrophysically observed x-ray excess by fluorescent dark matter. Such an avenue may open up with this device. Such an effort along with the astrophysical observations may become an important interdisciplinary development. In order to maximize the success of these implications, we recommend the formation of a broad international collaboration with the organizations and institutions that are engaging in related fields. Learning from these labs in their technologies, practice, and collaborative engagements should reduce risks and duplications and enhance learning and the scope of experience. Collaborations with a variety technology sectors are important both for the execution of experiments and their applications. The authors are grateful for close discussions with all the committee members (Naiyan Wang, Roland Sauerbrey, Pisin Chen, See Leang Chin, Thomas Edward Cowan, Thomas Heinzl, Yongfeng Lu, Gerard Mourou, Edmond Turcu, Hitoki Yoneda, Lu Yu) of SEL. The discussions with Profs. T. Tait, K. Abazajian, T. Ebisuzaki, and K. Homma were also very useful. Prof. X. M. Zhang helped with our manuscript. 1. Report of the International Review Meeting for Station of Extreme Light (2017). 2. G. A. Mourou, T. Tajima and S. V. Bulanov, Optics in the relativistic regime, Rev. Mod. Phys. 78, p. 309, 2006. 3. T. Tajima, K. Mima and H. Baldis, Eds., High-Field Science, Kluwer Academic/Plenum Publishers, New York, NY, 2000. 4. T. Tajima and G. Mourou, Zettawatt-exawatt lasers and their applications in ultrastrong-field physics, Phys. Rev. ST AB 5, p. 031301, 2002. 5. G. Mourou and T. Tajima, Summary of the IZEST science and aspiration, Eur. Phys. J. ST 223, pp. 979-984, 2014. 6. T. Tajima and J. M. Dawson, Laser electron accelerator, Phys. Rev. Lett. 43, p. 267, 1979. 7. C. K. Lau, P. C. Yeh, O. Luk, J. McClenaghan, T. Ebisuzaki and T. Tajima, Ponderomotive acceleration by relativistic waves, Phys. Rev. ST AB 18, p. 024401, 2015; T. Tajima, Laser acceleration in novel media, Eur. Phys. J. ST 223, pp. 1037-1044, 2014. 8. T. Ebisuzaki and T. Tajima, Astrophysical ZeV acceleration in the relativistic jet from an accreting supermassive blackhole, Astropart. Phys. 56, pp. 9-15, 2014. 9. T. Tajima, B. C. Barish, C. P. Barty, S. Bulanov, P. Chen, J. Feldhaus, et al., Science of extreme light infrastructure, AIP Conf. Proc. 1228, pp. 11-35, 2010. 10. T. Esirkepov, M. Borghesi, S. V. Bulanov, G. Mourou and T. Tajima, Highly efficient relativistic-ion generation in the laser-piston regime, Phys. Rev. Lett. 92, p. 175003, 2004. 11. G. Mourou, S. Mironov, E. Khazanov and A. Sergeev, Single cycle thin film compressor opening the door to Zeptosecond-Exawatt physics, Eur. Phys. J. ST 223, pp. 1181-1188, 2014. 12. N. Naumova, J. Nees, I. Sokolov, and G. Mourou, Relativistic generation of isolated attosecond pulses in a λ3 focal volume, Phys. Rev. Lett. 92, p. 063902, 2004. 13. G. Mourou and T. Tajima, More intense, shorter pulses, Science 331, pp. 41-42, 2011. 14. M. Marklund and P. K. Shukla, Nonlinear collective effects in photon-photon and photon-plasma interactions, Rev. Mod. Phys. 78, p. 591, 2006. 15. A. Di Piazza, C. Müller, K. Z. Hatsagortsyan and C. H. Keitel, Extremely high-intensity laser interactions with fundamental quantum systems, Rev. Mod. Phys. 84, p. 1177, 2012. 16. A. J. Krasznahorkay, M. Csatlós, L. Csige, Z. Gácsi, J. Gulyás, M. Hunyadi, et al., Observation of anomalous internal pair creation in Be 8: a possible indication of a light, neutral boson, Phys. Rev. Lett. 116, p. 042501, 2016. 17. J. L. Feng, B. Fornal, I. Galon, S. Gardner, J. Smolinsky, T. M. Tait and P. Tanedo, Protophobic fifth-force interpretation of the observed anomaly in Be-8 nuclear transitions, Phys. Rev. Lett. 117, p. 071803, 2016. 18. K. Homma, D. Habs and T. Tajima, Probing the semi-macroscopic vacuum by higher-harmonic generation under focused intense laser fields, Appl. Phys. B 106, pp. 229-240, 2012. 19. T. Tajima, Laser acceleration in novel media, Eur. Phys. J. ST 223, pp. 1037-1044, 2014. 20. X. Zhang, T. Tajima, D. Farinella, Y. Shin, G. Mourou, J. Wheeler and B. Shen, Particle-in-cell simulation of x-ray wakefield acceleration and betatron radiation in nanotubes, Phys. Rev. AB 19, p. 101004, 2016. 21. T. Tajima, M. Kando and M. Teshima, Feeling the texture of vacuum: laser acceleration toward PeV, Progr. Theor. Phys. 125, pp. 617-631, 2011. 22. T. Tajima, G. Mourou and K. Nakajima, Laser acceleration, Riv. Nuovo Cim. 40, p. 1, 2017. 23. P. Chen and G. Mourou, Accelerating plasma mirrors to investigate the black hole information loss paradox, Phys. Rev. Lett. 118, p. 045001, 2017. 24. C. Pellegrini, A. Marinelli and S. Reiche, The physics of x-ray free-electron lasers, Rev. Mod. Phys. 88, p. 015006, 2016. 25. S. Corde, K. T. Phuoc, G. Lambert, R. Fitour, V. Malka, A. Rousse and E. Lefebvre, Femtosecond x rays from laser-plasma accelerators, Rev. Mod. Phys. 85, p. 1, 2013. 26. S. V. Bulanov, T. Z. Esirkepov, M. Kando, H. Kiriyama and K. Kondo, Relativistically strong electromagnetic radiation in a plasma, J. Exp. Theor. Phys. 122, pp. 426-433, 2016. 27. S. Gales, IZEST meeting presentation, ELI-EP, French Embassy in Tokyo, 2013. https://gargantua.polytechnique.fr/siatel-web/linkto/mICYYYSI7yY6. Accessed 10 November 2017. 28. D. Habs and U. Köster, Production of medical radioisotopes with high specific activity in photonuclear reactions with γ-beams of high intensity and large brilliance, Appl. Phys. B 103, pp. 501-519, 2011; Ö. Özdemir, Eds., Current Cancer Treatment – Novel Beyond Conventional Approaches, INTECH Open Access Publisher, 2011. 29. A. Bracco and G. Köerner, Eds., Nuclear Physics for Medicine, Nuclear Physics European Collaboration Committee, 2014. 30. F. Krausz and M. Ivanov, Attosecond physics, Rev. Mod. Phys. 81, p. 163, 2009. 31. T. Tajima, T. Tait, and J. Feng, private comment, 2017. 32. F. Day and M. Fairbairn, submitted to J. High Energy Phys., 2017. XFELs, the latest generation of light sources based on linacs, are particularly suitable applications for high-gradient X-band technology. Following decades of growth in the use of synchrotron X-ray facilities to study materials across a wide spectrum of sciences, technologies and applications, XFELs (as opposed to circular light sources) are capable of delivering high-intensity photon beams of unprecedented brilliance and quality. This provides novel ways to probe matter and allows researchers to make “movies” of ultrafast biological processes. Currently, three XFELs are up and running in Europe – FERMI@Elettra in Italy and FLASH and FLASH II in Germany, which operate in the soft X-ray range – while two are under commissioning: SwissFEL at PSI and the European XFEL in Germany (CERN Courier July/August 2017 p18), which operates in the hard X-ray region. Yet, the demand for such high-quality X-rays is large, as the field still has great and largely unexplored potential for science and innovation – potential that can be unlocked if the linacs that drive the X-ray generation can be made smaller and cheaper. Success for CompactLight will have a much wider impact: not just affirming X-band technology as a new standard for accelerator-based facilities, but advancing undulators to the next generation of compact photon sources. This will facilitate the widespread distribution of a new generation of compact X-band-based accelerators and light sources, with a large range of applications including medical use, and enable the development of compact cost-effective X-ray facilities at national or even university level across and beyond Europe. In one study, researchers from Sweden, Japan and South Korea used a femtosecond X-ray laser to investigate the behavior of evaporatively supercooled liquid water, and to confirm the long-suspected view that water at low temperatures can exist in two different liquid phases (Science). In the other, a U.S.-Japanese team used high-resolution inelastic X-ray scattering to probe the dynamics of water molecules and how the liquid’s hydrogen bonds contribute to its unusual characteristics (Science Advances). To move past that barrier, a research team led by Anders Nilsson of Stockholm University, Sweden, turned to the rapid timescales enabled by femtosecond X-ray free-electron lasers (XFELs). At XFEL facilities in Korea and Japan [un-named], the team sent a stream of tiny water droplets (approximately 14 microns in diameter) into a vacuum chamber, and fired the XFEL at the droplets at varying distances from the water-dispensing nozzle to obtain ultrafast X-ray scattering data. A second set of experiments, from researchers at the U.S. Oak Ridge National Laboratory, the University of Tennessee, and the SPring-8 synchrotron laboratory in Japan, looked at water’s dynamics at room temperature, using inelastic X-ray scattering (IXS). Here, the research team was interested in sussing out how water molecules interact in real time, and how the strongly directional hydrogen bonds of water molecules work together to determine properties such the liquid’s viscosity.